This plugin is a specialised implementation of Bob Dougherty's Local Thickness plugin, which defines the thickness at a point as the diameter of the greatest sphere that fits within the structure and which contains the point. The plugin calculates mean and standard deviation of the trabecular thickness (Tb.Th) and trabecular spacing (Tb.Sp) directly from pixel values in the resulting thickness map. The plugin assumes that trabeculae are the foreground (255) of a binarised image. Processing time is heavily dependent on feature size (in pixels); large features can take a very long time to process. In these cases, consider reducing resolution so that each feature is resolved by fewer, larger pixels. 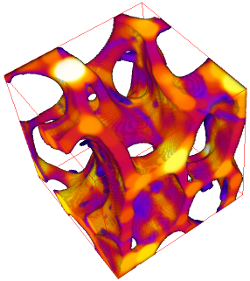 Dougherty R, Kunzelmann K (2007) Computing local thickness of 3D structures with ImageJ. Microsc. Microanal. 13: 1678-1679. doi:10.1017/S1431927607074430. Hildebrand T, Rüegsegger P (1997) A new method for the model-independent assessment of thickness in three-dimensional images. J. Microsc. 185: 67-75. doi:10.1046/j.1365-2818.1997.1340694.x. Trabecular Spacing: Calculate Tb.Sp (thickness of the background). Graphic Result: display 32-bit thickness map, in which each pixel value equals the thickness at that point. Use ROI Manager: limit Tb.Th and Tb.Sp calculations to ROIs in the ROI Manager. Mask thickness map: apply a correction to the thickness map to remove any thickness map pixels that overhang the input pixels. Optional thickness maps displaying thickness at each point in the structure. Thickness does not handle anisotropic voxels; it assumes distances between pixels are the same in all directions. Although results are reported using the ASBMR abbreviations "Tb.Th" and "Tb.Sp", Thickness has no idea of the true nature of the structures that the image represents, be they trabeculae, cortex, marrow, air, cake, rock or polymer. This file last modified 1124hrs 07 July 2014 © Michael Doube 2004-2019 :: Designed to be interoperable and standards-compliant.